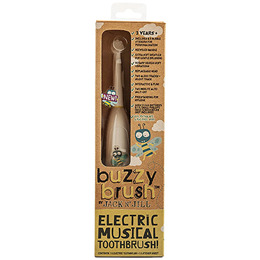 Buzzy Brush is suitable for use from 3 years + (adults can use it too!). The Super Gentle Rotary Action along with Soft Dupont Nylon Bristles. There are 3 modes with memory function means Buzzy will revert to the setting used previously. The brush can be personalised by using the adorable bubble stickers supplied. Make it truly their own. Replacement heads available. Recycled & Recyclable ABS (non toxic) handle BPA, PVC & Phthalate Free. Choose between audio tracks! 1. Full song. 2. Silent track with audio reminders every 30 seconds. 3. Full silent track. All tracks have auto-shut off after 2 minutes. Memory function returns to previously used setting! To insert 2 x AA batteries: Pull down firmly to remove base. Do not immerse battery compartment in water! Below are reviews of Jack N` Jill Buzzy Brush Electric Musical Toothbrush by bodykind customers. If you have tried this product we'd love to hear what you think so please leave a review. 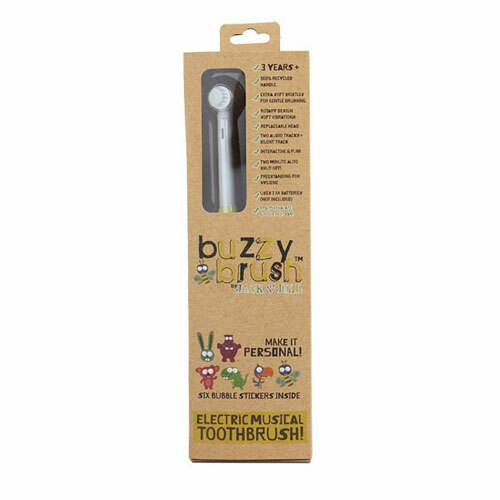 Buzzy Brush is suitable for use from 3 years + (adults can use it too!). The Super Gentle Rotary Action along with Soft Dupont Nylon Bristles. There are 3 modes with memory function means Buzzy will revert to the setting used previously.